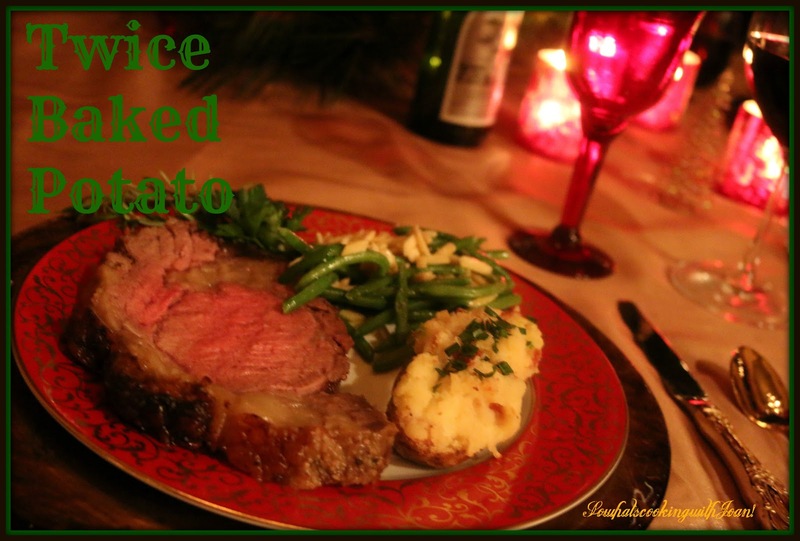 This holiday season we are enjoying a standing rib roast, also known as prime rib. 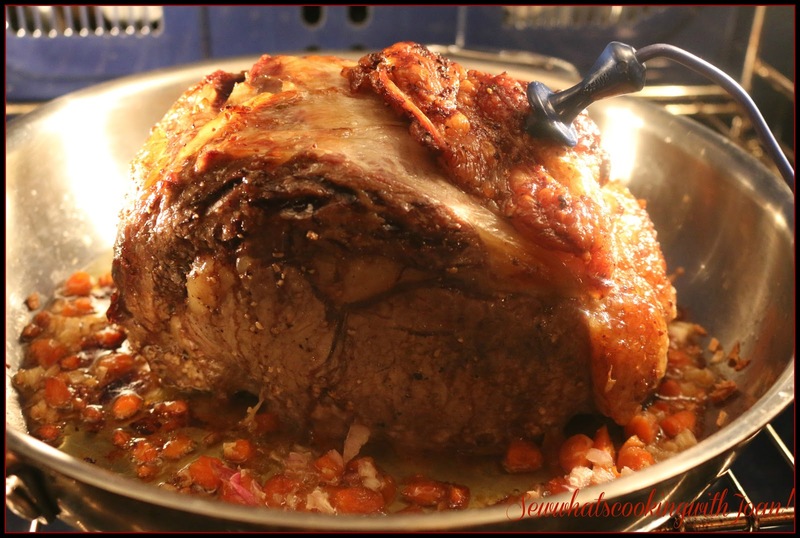 This amazing cut of meat is sure to dazzle any dinner guests you have during the holidays. Not only is the flavor amazing, but the presentation is quite impressive. I made this one last Sunday for Wee Bear and I, Wee Bear dug deep into the cellar for an impressive 2004 Napa Silver Oak Cabernet Sauvignon, and it was a party!! 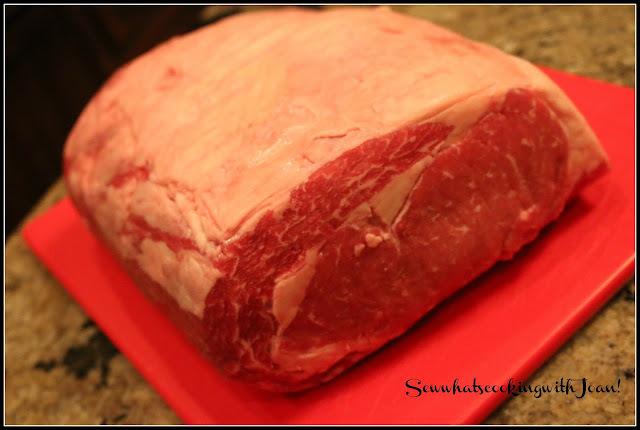 A beautiful beef roast makes an impressive and delicious centerpiece for any special occasion. Best of all, this show-stopping main course is surprisingly easy to make and serve. Rib roast, often referred to as "prime rib" or "standing rib roast," is the grand champion of beef roasts, combining rich flavor, juicy tenderness and spectacular appearance. 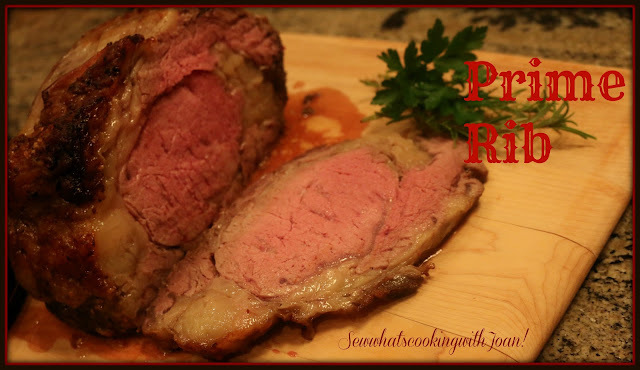 A full rib roast contains seven ribs, but is often sold in smaller sizes. To determine how much to buy, I buy one rib for every two people. Overall, the secret to success when preparing a beef roast is knowing when the desired degree of doneness is reached. Your best gauge is a reliable ovenproof meat thermometer. Cooking time will be about 4-5 hours. Roast has to rest for about 20 minutes before carving. Rub the roast with oil. Mince 2 garlic cloves and mix with salt and pepper. Rub mixture into meat and place bone side down into a shallow roasting pan. Keep at room temperature for 1-2 hours, before roasting. Can also be seasoned the day before, covered and refrigerated overnight. Allow to come to room temperature before cooking, 1-2 hours. Place a rack in middle of oven. Add the shallots, garlic cloves and carrots to the pan and roast on top of vegetables, bone side down, insert your oven probe thermometer at this point if you have one. Continue roasting until a probe thermometer or instant read thermometer, inserted in large end, registers 120F for rare, or 125F for medium rare, basting occasionally. It should reach it's temp in about 4-5 hours. Check the meat at 4 hours to avoid over cooking. Meat will rest 20 minutes and the temperature will go up 10 degrees during this time. ( Another option is to let the roast sit for 1- 1 1/2 hours, uncovered allowing you to cook the side dishes if you have one oven) Turn the oven up to 500 F and brown the roast, about 12 minutes, just before serving. While meat is taking it's rest, add the beef stock to the pan and bring to boil. Scrape up any brown bits from the bottom of pan and mash the vegetables. Cook for 2 minutes. Pour through sieve into a small saucepan and simmer for 2 minutes. Adjust seasoning. Pour into a heated sauce boat, this is your au jus! Mix horseradish and mustard with whipped cream to taste. Season with salt and pepper. Pour the wine and enjoy!! Please tell me you are all done with your Christmas shopping and are sitting back with a flute of champagne, watching the flakes of snow fall by a toasty fireplace! Are you totally finished? Are you halfway there? Or have you not started yet? 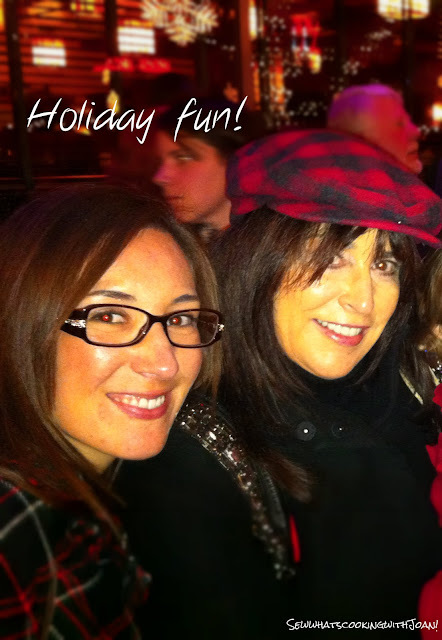 Either way, take time to enjoy the season..........take the kids to the local Holiday show, or out to go sledding. If you are retired, as we are, get together with family, friends and grandchildren, just enjoy the colors, the music and the vibe of the season..........I just love it! This sounds like the perfect meal on a nice snowy day in New England! Maybe I'll do this after Christmas when it snows.